Hugh Williamson was born in West Nottingham Township in southeastern Pennsylvania. His parents, Mary Davison and clothier John Williamson, were Scots-Irish Presbyterians who had emigrated from Ireland. After his first instruction at a nearby country school, young Williamson learned languages at the Chester County academy established by Rev. Francis Alison, who became rector of the Academy of Philadelphia in 1752. At home, he studied and mastered Euclid’s Elements. In 1754 Williamson entered the College of Philadelphia (now the University of Pennsylvania) as a member of its first graduating class. He earned his bachelor’s degree in 1757, later taking a master’s degree in course. He was a tutor in the Academy’s Latin School from 1755 to 1758. Williamson became a Renaissance man who excelled in many fields. In 1759, Williamson went to Connecticut, where he pursued his theological studies and was licensed to preach the Gospel. He was admitted to the Presbytery of Philadelphia when he returned from Connecticut, but soon made the first of several changes in his professional direction. In 1761, he was appointed professor of mathematics in the College, and retained the position until 1763. He then began his study of medicine, leaving for Europe in 1764 to study medicine at the University of Edinburgh. Williamson completed his medical education at Utrecht, passing an examination and submitting a thesis in Latin in order to receive a Doctor of Medicine in 1772. After a grand tour of the continent, he returned to Philadelphia where he practiced medicine for some years with great success. 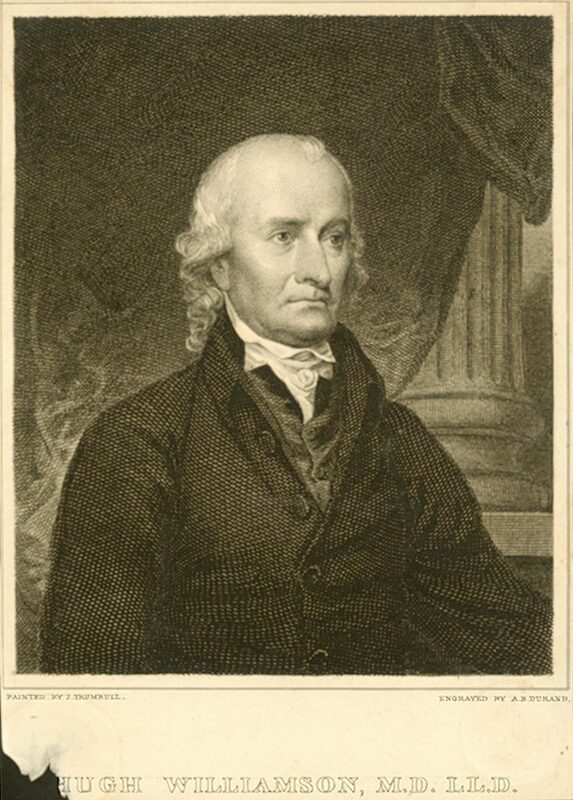 In 1768, he became a member of the American Philosophical Society, where he was in 1769 appointed along with David Rittenhouse as part of a committee to observe the transit of Venus. He later won considerable recognition through the publication of many of his scientific articles and collaboration with Benjamin Franklin. In 1775, while in London to seek funding for the Newark Academy, he delivered a paper on electricity before the Royal Society. After his return to the colonies in 1776, Williamson settled first in Charleston, South Carolina, and then in North Carolina as a merchant and physician. During the Revolutionary era, Williamson served as surgeon-general of the North Carolina Militia from 1779 to 1782, a member of the House of Commons of North Carolina in 1782, and a member of the Continental Congress from 1782 to 1785 and then from 1787 to 1788. He was the most vocal of North Carolina’s delegates to the 1787 federal Constitutional Convention at Philadelphia. Williamson was in favor of representation by population in order to favor larger states and, although himself against slavery, he accepted the compromise that allowed the slave trade to continue for twenty more years. In 1789 Williamson was elected a representative from North Carolina to the U.S. Congress, where he opposed the Bank of the United States, the assumption of state debt by the federal government, the whiskey excise tax, and the Jay Treaty. After two congressional terms, he moved in 1793 to New York City where he resumed his scientific research, his writing, and his involvement in cultural activities. He published works on a variety of subjects, including reptiles, the history of North Carolina, lightening rods, and the relationship between climate and disease. He was an advocate of what would eventually become the Erie Canal as well as a founder of New York’s Literary and Philosophical Society, a trustee of New York’s College of Physicians and Surgeons, and a volunteer for the orphan asylum, the humane society, and New York Hospital’s city dispensary. In January 1789, he married Maria, daughter of the Hon. Charles Ward Apthorpe, who died when the younger of their two sons was a few days old. Williamson himself died in New York City on May 22, 1819.